Team members with the prize won (left: Vahid Rastinasab (Iran), Fatih Avci (Turkey), KERROUCHE Kamel Djamel Eddine (Algeria), ADNANEAkram (Algeria) AREZKIFaiza (Algeria), Maria Guarirapa (Venezuela), Johonny Uscategui ( Venezuela), NEHAR Salaheddine (Algeria). 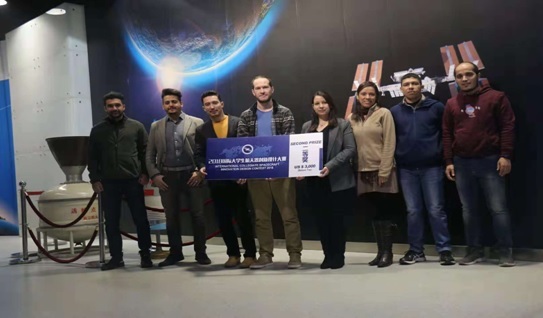 A multidisciplinary team of international students from the University of Beihang (China), made up of four (4) engineers from Algerian Space Agency (ASAL), received two awards at the International Collegiate Spacecraft Innovation Design Contest (ICSIDC) which was held at the Harbin Institute of Technology (HIT), Heilongjiang Province, China in late 2018. This competition was hosted by the Chinese Astronautics Society (CSA), the Association of Sino-Russian Technical Universities (ASRTU), Harbin Institute of Technology, Bauman State Technical University Moscow (UEBM). It was organized by the Harbin Institute of Technology and Shanghai Institute of Aerospace Control Technology. Forty-seven (47) teams from several countries including China, Russia, Poland and Belgium took part in the final competition. The four (4) Algerian are Mrs. Arezki Faiza; Mr. Kerrouche Kamel Djamel Eddine; Mr. Adnane Akramet Mr. Nahar Salaheddine of the Algerian Space Agency Satellite Development Center (CDS/ASAL), of different specialties (electronics, computer, automatic and astronautics). The second prize of this prestigious competition ICSIDC 2018, valued at $ 3000, rewards this team for its work done relating to the engineering model of the nano satellite “EcoBelt-Sat1” under the project named “Monitoring Air Pollution and Detecting Renewable Energy Areas among the Belt and Road Countries with a CubeSat”. the second payload is based on the GNSS-R reflectometer. 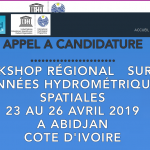 the experiment aims to highlight the capabilities of the GNSS signal reflection observation system, in particular to derive geophysical parameters from ocean / land surfaces and wind speed. These two (02) payloads will provide data that will be used for the implementation of renewable energy projects, particularly those related to wind and solar systems. In addition, another award was won by this team for the project entitled “Nano Satellite Design for Transportation System Management and Risk Detection for Belt and Road Countries”. Detection of natural hazards and management of an effective emergency plan.